I often consider makeing my photos black and white but 90% of the time I like them better in color. This is one of those rare times when I looked at the black and white and thought it really improved the photo. The color version contain a lot of green (from the grass and moss) and a very blue sky which distracts from the crumbling temple. 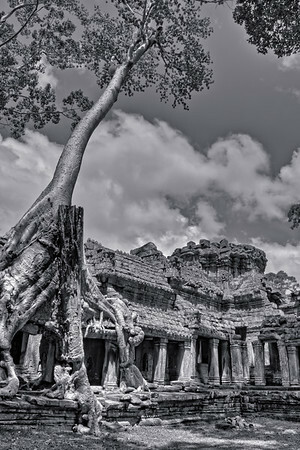 The black and white version allows you to better view the ancient temple which is the best part of the photo.